I’m not usually a big fan of the concept of Cordon Bleu, as I’ve never really been much of a ham guy, or turkey type of guy, for that matter. I’m particular with my roast beef too, if it isn’t from Arby’s or that style, I’m not a fan. I really should learn what they do that makes me like it so much so that I can order roast beef from the grocery store or another restaurant. Which reminds me, my wife finally agreed to go to Arby’s (she’s not the biggest fan) and they were out of roast beef! I went with one of their new deep fried turkey sandwiches but I should have just went somewhere else. That was pretty disappointing. This was another receipt that my son, Walker Dennis, helped me prepare. He really got into shredding the ham. I thought he was doing it too much so I was essentially just quartering the ham slices we got from the Walmart deli. I didn’t care for the ham, separately, but during the end result, it was pretty tasty. We usually go with a black forest ham but went with another option, it wasn’t honey as my wife doesn’t like that variety but I’m having a hard time remembering. She’s a big fan of ham, so she’s regularly getting the ham sandwich from Hardee’s and Arby’s. I’m coming around on Swiss cheese, I hated it as a kid but my taste palette has really come a long way in the past few years. My son also loves stuffing so that was a big hit. He didn’t eat much of the dish proper but he ate up the stuffing. I’m behind on my Riverdale as we were closing up the third season of the Nick TMNT third season. That ends on such an intense note! I really want to launch into the fourth season, especially the first episode but I need to take the long weekend to get caught up on Riverdale. The Sony BluRay player we have in our son’s room doesn’t have the CW, so I have to stick with watching it on the Kindle. Eventually, we’ll be able to find the Roku Stick that was on his television prior to our big move. We have so much in storage that we haven’t come across it, and we thought we opened every box. It is in a safe spot, is what I’m thinking. I imagine it is in my comic book box that also has my Notary Public stamp. I found my book in another box but not the stamp. Which is the part I really need to so I can help out the office being another Notary Public. That comic book box didn’t have my six or so issues that I bought from Hastings that I never got around to reading so I want to find that second box as there are some other documents in there too. That’s from my memory, at least. We’re caught up on most of our shows. The Monday night episode of the Voice was pretty disappointing, I only liked three of the songs. There are no many contestants and their video packages are not leaving much of an impression on me. I had to look up their names and songs from Wikipedia. I thought Brook Simpson (Team Miley)’s rendition of Praying lacked a lot of the purpose of Kesha’s version, which makes sense as it is an extremely personal song. Which is a concept that I keep coming back to with artists like Ed Sherran that he writes all of these personal songs, then within six months of the album (or single) release, randoms are now singing them on singing competition shows, like they were just words put to music. It is an odd concept that I’m just now thinking about. That’s what happens with popular music, the artist releases it to the world and one never knows how the word is going to respond. My main problem with the episode was that song selection was pretty lousy. I just want some fun upbeat songs, or if you are going to do a slower song, you have to knock it out. I liked Chloe Kohanski (Team Blake) with Dido’s Thank You, probably the real winner of the night, for me. But I could have just did without the episode. Am I surprised that Team Adam had two people in the bottom two? No, of course not. I imagine the winner will either be from Blake or Miley’s team. JHud has such a team that they are pretty exchangeable. Also, the Instant Save song, better just be a fun upbeat song, so people see that you are fun and a delight to keep seeing in the competition. Let’s hope that Adam Cunningham can take some notes and isn’t leaving next, even though, he really should be next. Which is the point of the Instant Save, to put a contestant on notice and go in a new potentially winning direction. Dancing with the Stars 25 big winner is Lindsay and Jordan Fisher won, which makes complete sense. Fisher is essentially a professional dancer. There is a fun piece of trivia with Lindsay coming in fourth, third, second and now, finally, first, over the past four consecutive seasons. Which is a record that someone on production must have gotten the word out on. It wasn’t a bad season, I had to read the result as I had to get to work this morning and didn’t wake up early enough to finish the entire episode. We got fully caught up on last week’s show by last thing Sunday night. Now that Dancing is over, we should be able to start tackling our backlog of shows. I really want to continue watching Stranger Things 2 and Inhumans. We saw the first episode of Runaways, I really dug it. Alex is pretty cast perfect with his look. It bugs me that Molly is the same age (maybe a year younger?) but it makes sense. A 12 year old would be pretty limited with her screen time, BUT she didn’t get that much screen time, so what would be the harm? We’ll probably try to watch the next episodes once we get one more of the other shows seen. I like how Hulu released the first three, so that’s pretty nice. Our next episode of The Office Season Seven is The Search. I’ve been so pleased with Hartley Sawyer’s take of Elongated Man on this season of The Flash. I keep waiting for them to give him that soft lavender costume. Plus a gal named Sue! That’s what that show needed. I’m on episode 96 of Living Between Wednesdays, wherein Rachelle and Dave rate Elongated Man for the revised Super Hunks feature. I wish they would do a proper blog post for the new ratings, that’ll be nice. They make the joke about how the choice is out of the blue as there was nothing keeping him in the public consciousness. But to me, it made perfect sense as he’s on The Flash now but they’re still so far in the past that there probably wasn’t even casting news. Heck, I didn’t even know he was joining the show until they said Ralph Dibny’s name. Then it took me several minutes before I realized I did recognize that name. The podcast episode came out in June 2017, the week after Wonder Woman came to theaters. I’m hoping I get her BluRay for Christmas and finally see that film. From what I’ve been told, I’m getting a slew of BluRays with digital copies of several superhero films. Wonder Woman and Spider-Man : Homecoming are my top two picks. I see Guardians of the Galaxy 2 is coming to Netflix in early December so the need for that one goes down a bit. We’re hoping to score a PS4 at either Target or Costco, as both have it for just under $200 and that’s a price I can’t say no too! For our anniversary, I’m hoping to get my wife that 43 inch television with built-in Roku as we’re fans of that setup. We’ve really need a new television for the living room. It is currently $280 so if it could go down to $250 for Black Friday, I’ll scoop one of those up too! My wife says that it was pretty low last year and hasn’t dropped in price since then so it must still be a $280 value television. I do like how Costco isn’t doing anything on Thanksgiving, good for them! Sadly, with a PS4 in our sights, we’ll be outside of Target around 5pm or so. I’m hoping they do the first hour guarantee. We’ve passed up on deals for controllers and such, already, as I don’t want buy any of the side stuff until owning the system itself. From my family to you and yours, have a Happy Thanksgiving! My wife an enlisted me to help her cook a corn casserole and a sweet potato casserole, so that’s what we’re contributing. And two different types of rolls from this great local place, Great Harvest. I still can’t believe tomorrow is Thanksgiving. I can’t wait to be out of the retail game and the holidays feel like real joys instead of obstacles that I have to endure until the day itself. It is tiring and the late nights are starting to catch up to me. I’m not sure how I came across buying Meja’s second album, Seven Sisters, but I did. I’m sure I heard “All ‘Bout the Money” and the CD was affordable and I bought it. This is one of those rare albums where you can play the first track, Lay Me Down, and play it through to the end with, Do The Angels Have a Home. Which I must have done for a while. Unfortunately, YouTube is letting me down with no videos of the entire album available – which may be the right thing to do, I’m not sure what the rules are on that. Thanks to YouTuber yuri20 for hosting this video. Thanks to YouTuber rrn3000 for hosting this video! This was a pretty nice meal, once again, it needs vegetables like onions and green peppers or something to make it not so starchy. My son was a huge help with preparing this dish, which is always fun to cook with the little man. For the chicken, while searing it, I cooked it with parsley, thyme and oregano. Instead of quartering the red potatoes, I cut them into eighths. Some probably should have been cut even more. 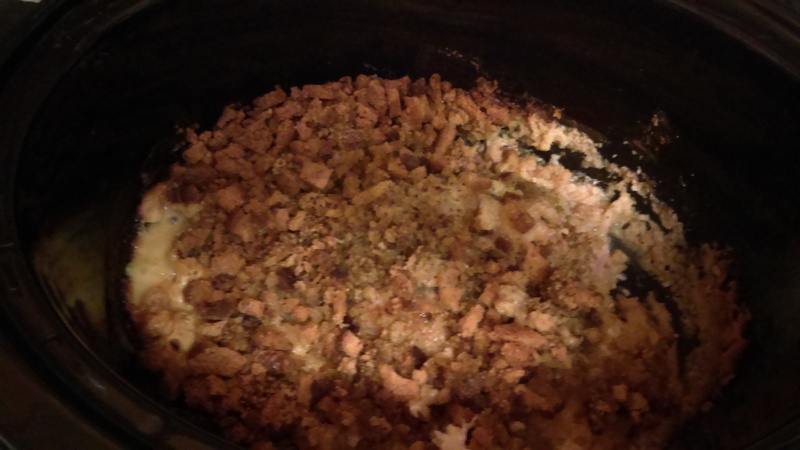 I never like slow cooker recipes that doesn’t require some liquid into it. So after the first hour, I added 1/2 cup of chicken broth to the pot. 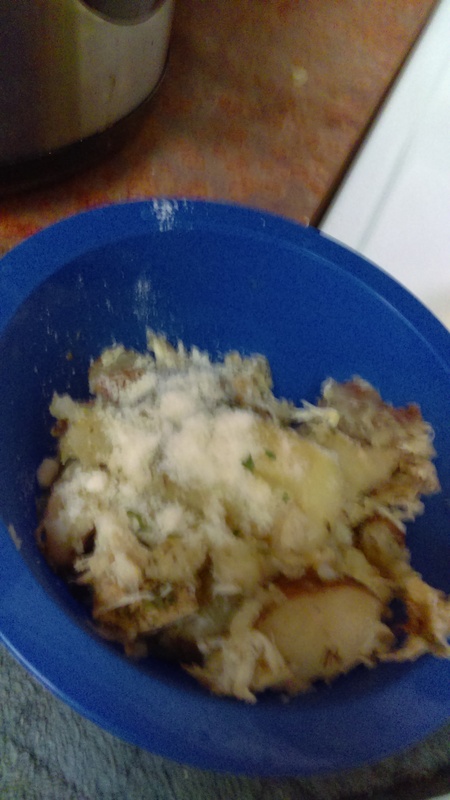 The potatoes had some water in them but I’ll add a full cup of chicken broth, next time. I’ll also add onions and green peppers, just something to add color and some additional flavoring. We had a big weekend of family events and television watching. We’re all caught up with our current shows. We are on episode seven of Stranger Things 2. My wife has a friend who originally comment that something outstanding happened in episode eight, so we’ve been eagerly anticipating that episode. Though I thought there were two big episodes before that, six being one of them. I’m just happy that Max got on the same page as the rest of them, her and Sean Astin, also getting on the same page, was great. I really hope he makes it through the season, I really like his character, Bob. Off the recommendation of Comic Book Queers, and wanting a show to end on a lighter note, we started watching Inhumans. We finished the first two episodes and it doesn’t seem campy or silly, yet. I’m glad we’re watching it. My wife finds it funny that Iwan Rheon is cast as another character who is “hassled” by dogs. He is Maximus on this show and was Ramsay Bolton on Game of Thrones. Karnak choosing the wrong rock to step on, is super puzzling, from the second episode. There is only eight episodes, so we should go through this rather quickly. Referring to eight episodes, we saw another clip of American Vandal, on Netflix, and I was super interested in watching it. I’m done with Doctor Who Season Nine, and I’ll have to wait until Season Ten is available for the Amazon Prime membership. I should check again on Hulu to see if Doctor Who made it back there. So now I’m looking for another show to watch. My wife saw the first episode with me and she said I could continue without her. She also recommended I watch The 100, she says it is up my alley. It is five seasons, right now on Netflix, so that might be more than I want to do. I’m all about the eight episode season. I’m currently on episode eight of Comic Book Queers and episode 85 of Living Between Wednesdays. I’m in the middle of episode 48, which is their current episode. Instead of releasing the Patreon episodes, all at once, they are labeling them with the next episode number, which is an interesting way to do it. It makes sense, as it gives them new content to release and it doesn’t drown a guy like me who is eagerly willing to listen to all of them. I see the third episode is out as episode 49, so I’ll have to listen to that. FPJr referenced in episode 48, that he did Chris Jericho’s podcast, so I had to add that to my playlist. Pretty great interview, and I really miss Chris Jericho. Been a fan of him since his Y2J entrance into WWE. I was so pleased when he become the first Undisputed Champion and was disappointed when HHH took the title from him, and I’m a pretty big HHH fan but I wanted Jericho to have it for a while. He never even got to hold the unified belt. Still, it is episode 212 of Talk is Jericho, and it is definitely an episode worth listening to. I remember, maybe it was for Batman Forever, of watching (or taping it on the ol’ VCR) and watching all the appearances of the cast. It may not have been that film but it was definitely for a superhero movie. The problem I learned, after the third appearance, was that the celebrity pretty much had the same story to tell, and had the same clip, too. Oh, it must have been the first X-Men film, in 2000, as I recall it was Patrick Stewart. He even did that thing of not knowing which clip was about to be shown, twice on two different shows and it was the same clip too. So I choose to stop watching any additional interviews. That run also made me realized that, when an actor is in New York, they just do all of the New York shows, which I hadn’t really thought about before. One can definitely tell, which actors were sent to which premieres, and when the premiere was, as they were in town for that and to do press. A long way to get to the point that FPJr likes to tell certain stories, which I enjoy but I may be following him too closely. I imagine these are stories that are tested well, and he tells well, so he’s comfortable with sharing these select stories of his past. I also saw that Turtle Soup 163 was dropped last week, Eric and Ryan are not the best at putting those notices on their Facebook page. I’m sure it is on the Slack channel, and maybe soon, I can start throwing ten dollars their way. Whenever Turtle Soup drops, that puts me back as the guys give us two hours of the best entertainment so that puts me back on other shows. Plus, I was pretty busy this week so I didn’t get to listen to as many podcasts as I’m use to. I also had the problem with wanting to put all of these episodes on my phone and kept running out of memory. I can’t wait until February when I can get a phone with at least 16MB, that’s all I care about. 8MB is killing me and has for so long now! We keep talking about getting a PS4 for Black Friday, Target and Costco are both selling them for around $185, so that’s too good of a deal to pass up. We’re not longer thinking of purchasing a Switch, as we’ll only want it for Mario Kart 8 Deluxe and Mario Odyssey, so maybe next year. There are like 25 games that I want on the PS4 so that’s taking up some brain space. TMNT Legends, I’m mostly trying to get into a new mindset of going after DNA cards and getting my team expanded. I almost got Donatello to three stars, I’m only one away. I may go crazy trying to get Michelangelo, after that. I did earn Space Michelangelo and now the tournament is for Space Leonardo so I feel pretty confidant that I can earn him as well. I did so well with Space Michelangelo that I got the two star version of him, whereas I only got the one star version of Space Raphael. I still miss the old DNA card missions but they did release a new Raphael challenge, last week, so I’m hoping that maybe some ways of getting DNA are coming back. In the Out of Shadows mode, I got movie Michelangelo and Rocksteady so, of course, I keep getting their DNA packs and rarely anyone else’s DNA. So close with so many others but I’m just trying to get DNA and getting my main five’s moves maxed out. Still not enjoying it like I used to but I’m finding ways to get new enjoyment out of it. In our rewatch of Season Three, we’re on episode Tale of the Yokai. Since we’re caught up on Riverdale and Doctor Who, I needed a new show and remembered our old show so that’s pretty fun. I recall these episodes so, somehow, we missed out on some of the early episodes of the season. Six more episodes and we’ll be able to start season four, which I’m pretty excited about. I completely forgot about The Office! We finished Season Six and well into Season Seven, our next episode is Viewing Party, episode 8. So I’ve really taken to cooking with Doritos! Next time, I think I’ll go with Spicy Doritos, add onion and some green peppers. This tasted pretty amazing but it could use some vegetables. One of these days, I’ll learn to just add onions and green peppers from the very start. We went to Walmart and was going to pie one of those disposable nine inch pie dish. It was going to come with two for around three dollars. Or we could just buy a nice glass one for the same price, so like an adult, I bought the glass one. We have a pie dish but it has straight edges instead of the nice classic pie slant edge and I really wanted that for the dish. I really liked the pepper jack cheese so I have to cook with that more. Maybe this is how I made it but the directions should have a note about how high up the pie is going to look, prior to putting it in the oven. 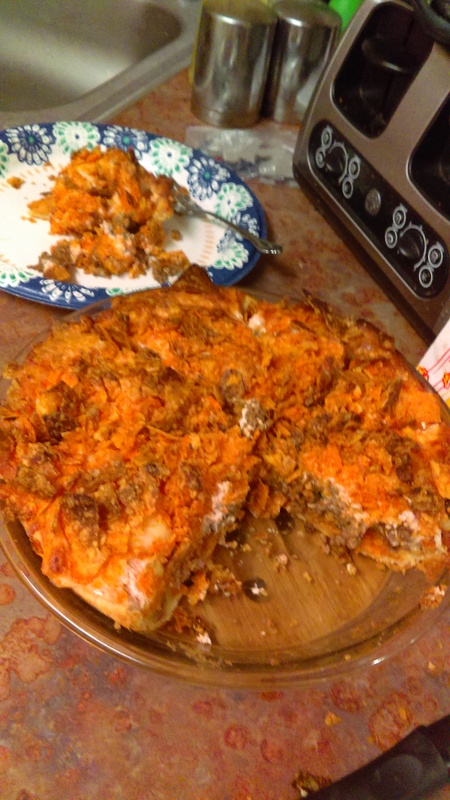 The Nacho Doritos top layer was falling to the side. I cooked it for 20 minutes but it probably was done at 15 as the top was a tad toasted. It was even good the next day! We’re really mowing through The Office Season Six, our next episode is New Leads. My wife keeps wondering when Steve Carrell leaves, so there is this odd build up towards that. I saw that episode when it first came out and like Phyllis’ wedding episode, enjoyed it but was a tad lost with the ongoing plotlines and wasn’t tempted to revisit the series or pick up and start watching it from that episode forward. Not sure what made me watch Phyllis’ wedding episode, seems completely random now. We are now officially current with Arrow, and it seems to be off to a good start. We have plans to catch up with Legends of Tomorrow in the future, probably watch last season, knowing there is no way to catch up to see the current shows. But that way, we will not be two seasons behind. We finally finished Person of Interest in an amazing four episode binge! Our son wasn’t great towards the last two episodes but some Playdoh later and everything was good. Such a great finale! We were not sure how it was going to end with twenty minutes left of the show. Walker Dennis and me watched Doctor Who Season 9’s Heaven Sent. We’re in the middle of Hell Bent but the Weeping Angels really scared him so we took a pause on that. Maybe tonight we can finish it. It is the season finale, so I really want to get back to it. We started Stranger Things Season Two. We saw Netflix has an after show, Beyond Stranger Things. My wife figured we’ll watch the entire second season and then watch Beyond. Good thing as that website states they give spoilers away so I’m glad we didn’t attempt it. I noticed it had two less episodes than the second season, so I figured it didn’t match episode per episode. Odd that they didn’t just do ten and ten, with the purpose of watching the show and then the aftershow and back to the show proper. That’s how I would have done it. The first episode was a pretty good start. I’m glad that the characters are not pretending that it didn’t happen. I thought the time jump to the next year was a good way to avoid any initial need to explain things. We’ll get those answers, as we go. I’m on episode 6 of Comic Book Queers, with two more before I’m caught up. I’m on episode 84 of Living Between Wednesdays, with so many more to catch up on. On episode 47 of Prinze and the Wolf, they announced that they are no longer doing Patreon episodes but will have a second feed for those bonus episodes. Which is awesome! I’ll have to add that backlog to my listening list, once it is available. I’m not sure how FM Player is going to handle that, as that’s how I listen to the episodes. Their official page was hard to work through the backlog with but now that I’m caught up, I should revisit it. I just checked and they don’t have the two feeds up yet. They released two Patreon episodes so far, so that’s two I can skip in that process. and they share my disappointments with the latest upgrade. Ludia Games really took away the DNA card option that I and so many others really enjoyed. I’ll throw a few Greenbacks towards buying DNA at a time but now, they are forcing people to buy five cards at a time for an extremely steep prize. I’ll just stick with the Gauntlet and the Out of the Shadows mission to try to obtain those DNA cards. Some people are hoping that Ludia changes the DNA back to how it used to be, which I also hope they do that. I also just need to bring up my characters so that I don’t just have a top five guys. I’m slowly getting a new set of five – Karai-Serpent, Shredder, Raphael, Casey Jones and Metalhead to level 45. That way, I might be able to do a few more things such as the Daily Challenge Modes and the Story Challenge modes, as of now, I pretty much only make it pass one or two levels and get stopped, hard. Which kills my buzz for the game. I too wish it would go back to how it was with the DNA card challenges. All they had to do was extend those challenges from four hours to being all day. Which they did have all day challenges that ended with DNA packs. I liked the ones that resulted in points towards DNA wherein we chose the character we wanted, as opposed to the ones that we had to earn like 2,500 points as I could never get to even to 1,000 points. Or something like that, I might be off by a zero, I rarely ever played those except for the experience points. So I don’t play the game all that much. A short time in the morning, during the second half of my lunch hour and a little before bed. I used to be addicted to the game but now I’ve cooled way down on it. I have 4,000 Greenbacks, so I’m waiting until I get 5,000 before buying any DNA cards through the shop, by then, Ludia Games may have reverted the system again. They apparently do read the Reddit page and one of the moderators has access to one of the crew members. Which I remember that being the way with the super fun Avengers Alliance on Facebook as Playdom was pretty involved with that message board too. I miss that game so much. I see TMNT Legends heading in that direction that brought that game down though. Hopefully Nickelodeon has a better relationship with Ludia Games than Disney had with Playdom. Disney inherited that game though, which might be a crucial difference. I still haven’t read X-Men Gold 13, I see the bag it is in but I keep thinking I’ll have this magical ten minutes but I need to just force it to happen. There’s something about reading a thirteenth issue and knowing I’m not going to read issue 14 nor the first 12 anytime soon that stops me from doing it. Then writing the post about it. I still have five other reviews to publish too, I need to get back into this. 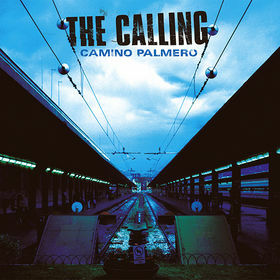 I’m sure it was Smallville that first introduced me to The Calling but their first album, Camino Palmero is simply perfect. Their second album, Two (great title! ), wasn’t that bad either. I read somewhere that The Calling is really just Alex Band and Aaron Kamin, without those two, there is no Calling, hence why the second album didn’t get much play as Kamin left. Thanks to Alex Band hosting his own video. Like most lead singers, their solo work just sounds like the band, so I had mistakenly thought that this was a new Calling song, when it first came out. Apparently the band as come together, in 2013, but that didn’t last long – I imagine as Kamin didn’t come back for it.